Three years after their successful debut with Continental Reel (Newtone Records - Nt 6753) the BIRKIN TREE are back in the studio to record their new album A Cheap Present. In the hiatus between the release of their two CDs, the BIRKIN TREE have gone even further out on their unique musical limb, becoming the leading exponents of Italian Celtic music as well as one of the most interesting examples of a non-Irish Celtic group. This new CD sees the BIRKIN TREE after almost twenty years of activity going from strength to strength and continuing to expand their musical horizons. Along with a plethora of traditional material the group have gathered from time spent hanging out with Irish folk musicians, the album also has room for several original compositions. So as well as the kind of well known songs one is likely to hear during a typical live session, some numbers will likely sound completely unfamiliar to the local players. The group’s instrumentation revolves around four musicians who alternate between soloing and collective playing. The result is a tight, cohesive sound to which is added the fifth voice of a harp. The vibrant rhythms and harmonies come from both harp and guitar picking, as well as percussion and keyboards. Another aspect of the Birkin Tree’s originality comes from their arrangements. The group have always made a point of respecting the spirit of tradition; None the less, the virtuosity of the musicians along with their own cultural roots gives the sound a flavor all its own, a sound whose harmony has a touch of the Mediterranean about it which inflects all the songs present on the album. All of which was highly appreciated when these songs were road tested the last time the band toured Ireland. In the album sleevenotes Martin Hayes, a virtuoso of the Irish fiddle, writes: "The group’s interpretations show that the music can be transmitted even at the highest levels outside the cultural context of Ireland…Thanks for the great work you’re doing for the music lads". Formed in 1982 by Fabio Rinaudo e Daniele Caronna, the BIRKIN TREE embarked on a serious and impassioned study of the Irish folk repertory which involved visits to Ireland. Over the years the group have played with some of the most important voices in Irish music such as John Martin, Tommy Peoples, Seamus McGuire and Martin Hayes; They have also accompanied the celebrated piper Liam O'Flynn and the duo Martin Hayes/ Dennis Cahill on their Italian tours.. THE BIRKIN TREE have taken part in numerous TV and radio programmes for Rai, TeleMontecarlo, RTS Svizzera, Radio Capodistria, Telepiù, RTE (Irish National Radio), Radio Kerry e Radio Clare. 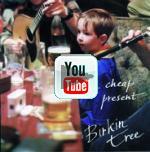 I BIRKIN TREE are the only italian group to have officially toured Ireland twice (in 1997 and 1998) participating in several local festivals (Feakle, Glencolumbeille, Caberciveen, Granard, Keadue). Their first album, Continental Reel, released in 1996 was voted the best album of the period 95-97 by the Italian review, Folk Bullettin, and sold remarkably well.